Unveiled to the world in Brazil in May, the facelifted Chevrolet Trailblazer has made its ASEAN debut at the BIG Motor Sale 2016 in Bangkok. The big seven-seater pick-up-based SUV goes on sale in Thailand alongside its also-refreshed Colorado sibling. 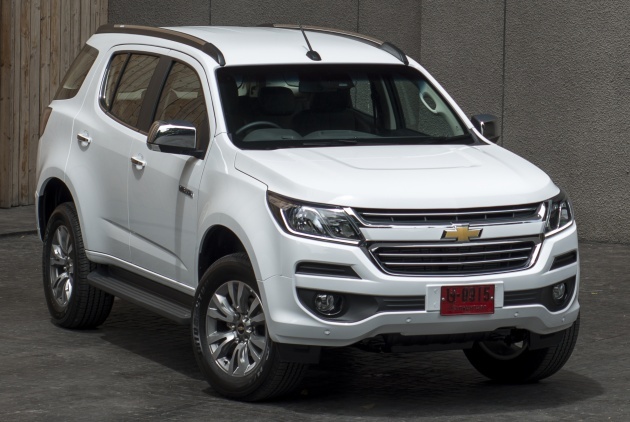 Prices for the Trailblazer in the Land of Smiles start at 1,244,000 baht (RM144,600) for the 2.5L VGT 4×2 LT, rising up to 1,379,000 baht (RM160,300) for the 4×2 LTZ and 1,479,000 baht (RM171,900) for the 4×4 LTZ. Like the Colorado, the Trailblazer gets a new front fascia design with a redesigned chrome-laden dual-port grille taking centre stage, matched to new headlights with LED daytime running lights and a revised front bumper design. There’s also a new 18-inch alloy wheel design for the LTZ variants, as well as new sidesteps for improved entry and egress. 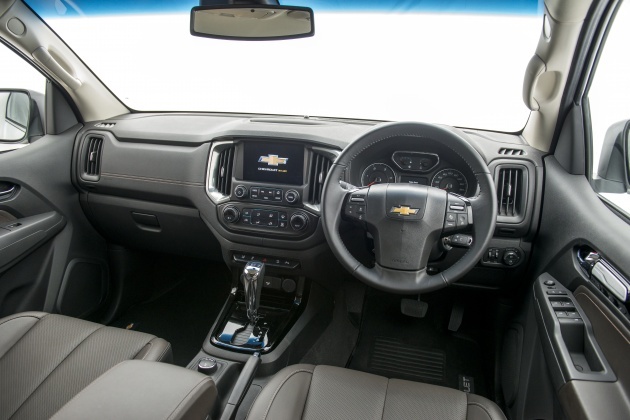 The biggest changes can be found inside – completely new dashboard and door trims take inspiration from the US-market Colorado with a more horizontal arrangement, while the cabin features soft-touch plastics on the LTZ models as well. There’s also a new instrument cluster with a new multi-info display showing a digital speedometer, maintenance intervals and oil life cycles. Standard kit includes remote engine start, keyless entry, push-button start, automatic headlights, power-adjustable seats, a new MyLink 2 infotainment system with a seven-inch touchscreen and Apple CarPlay and Android Auto compatibility (said to be the first in the segment), a reverse camera as well as windows that roll down slightly to ease closing. Move up, the LTZ models gain automatic wipers, automatic air-conditioning, an eight-inch touchscreen, seven speakers and front and rear parking sensors. The range-topping 4×4 model receives navigation. Under the bonnet, there’s a revised 2.5 litre Duramax turbodiesel engine that puts out 180 hp at 3,600 rpm and 440 Nm of torque at 2,000 rpm. Drive is sent to the rear wheels (or a part-time four-wheel drive system on the 4×4 LTZ) through a six-speed automatic transmission. Safety-wise, all models get three airbags (including a new driver’s knee ‘bag), ABS with EBD and brake assist, Electronic Stability Control (ESC), traction control, Hill Start Assist (HSA), Hill Descent Control (HDC), Trailer Sway Control (TSC) and Anti-Rolling Protection (ARP). Trump for the LTZ models and one gets Side Blind Zone Alert, Rear Cross Traffic Alert, Lane Departure Alert, Forward Collision Alert and a tyre pressure monitoring system (TPMS).